Here is the Black Chord CAL62 Electric Guitar. 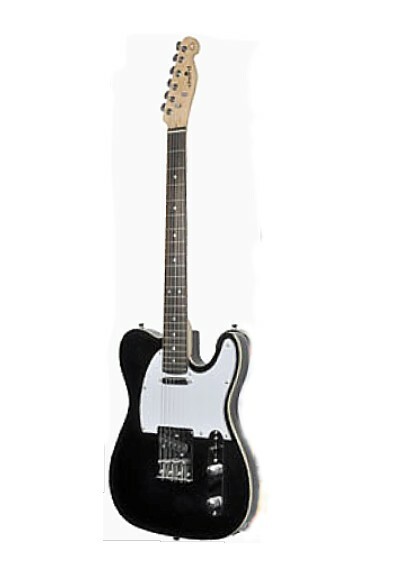 It is a traditionally styled slab body electric guitar, available in black with a white scratchplate. This guitar is a deluxe version, with it having an edge-bound solid alder body bolted to the maple neck. It has two single coil pickups, which are governed by the master volume, tone and three way lever switch. It is a single cutaway, traditional styled body, with a white scratchplate, 22 medium fret maple neck with rosewood fingerboard. Its is suitable for any type of playing, from country to rock. It is ideal for any level of musician also. Please Note: All guitars come with a fitted gig bag.